NGK Powerdex AFX UNIVERSAL - RPM - Racing Performance Motorsport - Your source for performance parts and accessories. 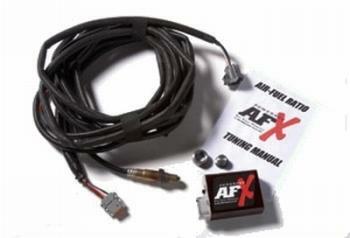 The NGK Powerdex AFX Air-Fuel Ratio Monitor offers the most affordable wideband system to date. A flexible and rugged system complete with everything needed to get you tuning. The kit comes with a digital display control module, 13’ wiring harness, wideband air-fuel ratio sensor, exhaust boss and plug, and a comprehensive tuning manual. The tuning manual includes installation instructions and contains a detailed guide to performance air-fuel ratio tuning. 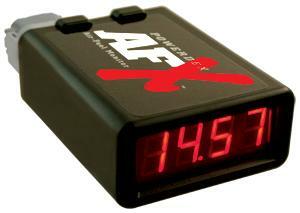 The NGK Powerdex AFX measures and displays air-fuel ratio (AFR) from 9.00 to 16.00. It demonstrates superb response and accuracy within 0.1 AFR. The air-fuel ratio information can then be utilized by the user to make fuel delivery adjustments to the vehicle’s carburetor, mechanical fuel injection, or programmable electronic fuel injection system. The desired air-fuel ratio can be achieved depending on the performance requirements of the engine or race application. This is an exceptionally useful tool for carbureted engines, where there is a lot of freedom in tuning as well as a great need for proper adjustment.